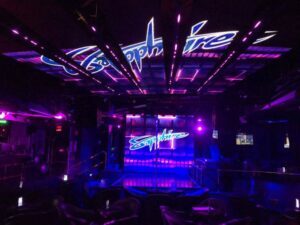 The Sapphire Club, one of New York City’s premier adult entertainment venues, is known for its high-end atmosphere and upscale amenities. Now, thanks to an FBT system designed by KPODJ, it’s also getting noticed for its superior sound quality. Since Sapphire is a 10,000 square-foot venue that regularly hosts celebrity DJs, that’s big news. When Tom Capo, manager and co-owner of KPODJ, was initially asked to design a sound system for the club, he knew he needed something to complement its sophisticated atmosphere. FBT was his first choice. Despite the main room of the club being one large space, zones were needed so that sound could be adjusted as the flexible seating in the room changes. A low ceiling also had to be considered when configuring the system. Capo met the challenge by installing three powered Muse 210LAs on each side of the stage; two Subline 218sa’s; a single-cabinet, passive Mitus 118S; and eight Ventis 206 speakers to round out the room. To control the zones, a digital matrix mixer was special ordered from Italy – FBT’s DMM8008 – that allows for multiple inputs and outputs, with separate line controls for each of the outputs. Capo was thrilled with the results. KPODJ, which was established in 2002 as a mobile DJ company, has now grown to include a storefront, warehouse and installation business that covers everything from sound and lighting equipment to trussing and scrims. As top distributors of some product lines, they’re also well-accustomed to dealing with premium items that stand head-and-shoulders above their competition – one of the reasons he says he prefers to deal with Italian Speaker Imports / FBT-USA, the exclusive distributor of FBT. FOH Online: "Tim Rushlow Brings FBT to Nashville Palace"